If you’ve spent any amount of time researching ways to promote your website you have probably come across the term social bookmarking. There’s no doubt it plays an important role and can indeed bring lots of targeted traffic to your site but how can the average webmaster harness the power. First of all let’s clarify what exactly social bookmarking is and I’ll try and use some semblance of plain English to explain it. The more you browse the web, the more sites you wish to revisit. Of course your browser has the facility to store favorites or bookmark sites but most find this quickly becomes unmanageable. There is also another problem these favorites are normally stored on your local computer – so log in some where else and you’ve lost them. The answer was the social bookmarking sites, which are very basically websites which store and sort all your personal favorite sites. Here’s one of the most popular called StumbleUpon and you can see just a brief snapshot of how it stores website, video, articles and anything that is stored on the web. The idea is that you can access this bookmarking list wherever you are and from any computer it will always be accessible. You can also sort and manage these bookmarks using categories and tags which can be used to group similar sites together. But there’s another crucial word involved in these sites particularly from the SEO perspective and that’s ‘social‘. This refers to the fact that your sites can be seen, viewed and rated by other users. Your bookmark is not only a reference to a favorite website of yours, it is also a recommendation to thousands of other users of that particular social bookmarking site. This is a very powerful indicator of the quality of the site you are listing. It is also an indicator to the search engines which is why social bookmarking is used for SEO is now an important part of site promotion. Imagine the search engines are desperately looking for ways to discover whether a site is useful, popular or interesting to it’s readers. A site that is popular in these social bookmarking sites is going to generally do well in the search rankings as well. So what does a webmaster do to bring in this traffic and search engine love to their web site? Obviously there’s limited advantage in going around creating your own bookmarking accounts and rating your own web pages. For a start they’ll be identified as all coming from the same person (based on a duplicate IP address) and you’ll likely get your account downgraded or closed. What you need to do is to raise awareness of your wonderful website (it is wonderful isn’t it? 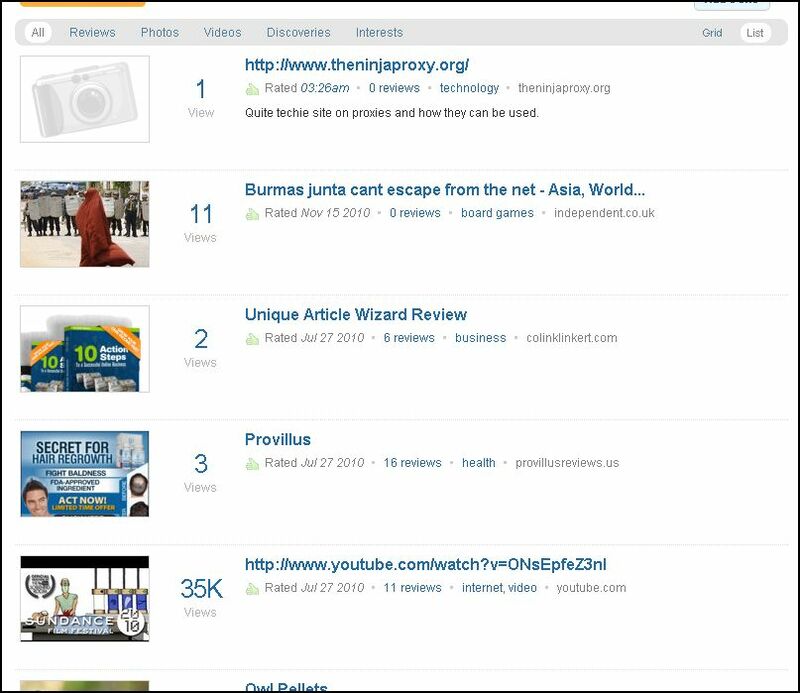 ), so you need other people to rate, rank and comment on your pages through their own bookmarking sites. There are many ways of doing this, quite a few social bookmarking software can be bought, some groups have set up co-operatives who bookmark each others sites. All of these can work but usually are so time consuming that they are not worth the effort, also if you leave a pattern behind then it can all be in vain. So for SEO purposes, it is important that other people promote your web pages and also that any method is relatively automated and simple. Now I’ve tried most of them the bookmarking software like bookmarking demon, socialbot (not good) and a few others. The groups worked better because their was real people bookmarking your site but it ended up taking so long was not really scaleable. There was only one that did the job with the absolute minimum of fuss and that’s a program called SocialAdr – it’s in a different league from anything out there. If you buy one of the subscriptions it can create hundreds of links, plus Tweets on your websites automatically – just like clockwork week in week out. The Free Version also works well but with a little more effort and is a good way of seeing how impressive the systems is. Whether you have the budget or not – I urge you to try out the Free version of Social Ad – at worst it will create loads of social bookmarking links to your website with little effort. If you like it – it could form the basis of your SEO efforts – it’s an incredible system. If you’ve studied any Search engine optimisation techniques at all, you should have learnt about the importance of building links to your web sites. A link pointing to your website is a ‘vote of confidence’ in the eyes of the search engines. There are some very important links I want to tell you about and the role of social bookmarking sites in SEO. You’ll see may different people telling you what sort of links to get, and there is no doubt that some are much more powerful than others. But basically the more links you get the better, and social bookmarking links are easy to get and usually have a powerful benefit on your rankings. This used to be quite easy, sign up for a bunch of accounts and then bookmark your own sites and all the pages. Unfortunately this doesn’t work anymore, build links from the same accounts, same IP addresses well at best you’ll just be wasting your time. You see you need other people to bookmark your site but obviously this isn’t quite as simple. But of course use Internet marketers are a resourceful bunch, methods were devised mostly groups of people set up to agree to bookmark each others web sites. Unfortunately these rarely worked for long, people stopped bookmarking other people sites or groups fell apart – it also took a very long time. I was a member of several of these groups and now I’m only in two such systems and I want to tell you about the very best of these. SocialAdr is a unique system, there is nothing like it on the market at all at the moment. It’s been developed over the last 12 months or so and now is one of the most powerful SEO tools in existence. SocialADR leverages the power of the social bookmarking sites to boost whichever website you like. Here is a quick look at the interface, it’s slick and well programmed and unlike 99% of all Internet Marketing tools pretty much bug free ! 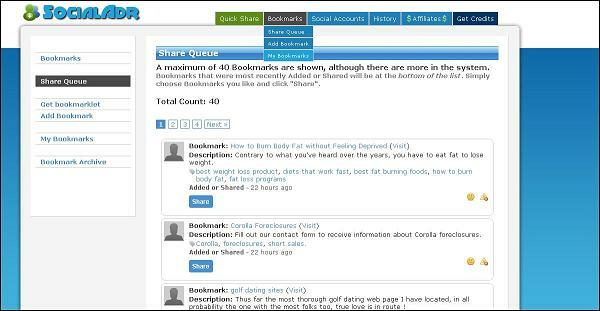 The system works like this, you set up accounts at currently 19 social bookmarking sites and put them into the system. It’s all done within the interface and takes a minute or so for each one. From this point this is the only interaction you have with these sites, it’s all done through Social Adr is powerful back end servers from now. You can then earn credits by bookmarking other peoples web sites, you simple click on the share button next to a website and you create a bookmark on all the accounts you created. You earn a credit for each one you share and the system keeps a count of these credits. You are then able to add your own websites into the system, select a page you want to get links to, type up a description and then other users will share your bookmarks. The beauty of this system is that the links you receive are from other peoples accounts, each time one of your bookmarks is shared then some credits are deducted from your total. You earn more credits by sharing other people sites again – how many credits (and thus how many links you get) is dependent on which plan you subscribe to. Having used lots of different internet marketing tools, I can’t stress enough what a class act this is. The interface is simple and easy to use, all functions take a matter of seconds – you can create literally thousands of backlinks to your sites with virtually no effort. A latest and vital introduction to the system is it’s ability to support spin syntax. This basically allows you to vary the text and keyword tags that are assigned to each boookmark making your links back more unique and natural looking. You probably know about the social networks and the importance that social bookmarking is for SEO. The search engines look for trust in web sites to push them up the ranking pages and this trust is gained from links to the pages themselves. From websites, blogs, forums and just about anywhere the more places your site gets links from the better the traffic and the rewards. Of course getting lots of links to your site is not as easy as it sounds, try mailing a few webmasters asking for links if you don’t believe me. However there is one area where you can get links, links that are highly valued by the search engines and will even bring you traffic – these are the sites like Digg and Stumble to name but a few. It’s true these sites play a huge part in a successful SEO strategy, and people who know how to leverage the power of these sites are reaping the rewards. The problem is that to gain links from these sites, valuable links you need to get lots of them. It’s no real use to log in to your own account and just bookmark your own sites. These will have little effect on your rankings, know you need lots of links, lots of recommendations to start seeing benefits but believe me they are worth it. So what do you do ? Of course you could create hundreds of accounts and profiles and slowly bookmark your site and hundreds of others. This is going to take forever and unfortunately if these all come from the same IP address at best your links will get ignored but more likely your accounts will get deleted. You can invest in thousands of proxies and VPNS, certainly and you can also find quick IP address changers that work well like this – http://thenewproxies.com/quick-ip-address-changer/, they’re still a lot of trouble and cost money to maintain. There is of course one obvious solution and that is to form big groups and arrange to bookmark each others web sites. This actually works well, the problem is that it is very time consuming and also needs someone to ensure that everyone sticks to their part of the deal. It does work to an extent, but to be honest it becomes very time consuming and the effect diminishes in my experience. There are a few firms who coordinate these groups and of course charge for the benefit. It’s something that I did for some time but gradually the time needed seemed to exceed the benefit so this particular form of Social bookmarking seo. There is another option though and this system is nothing short of revolutionary, I’ve been a member of this system since it started at the beginning of last year. It’s an incredible system, that works extremely well and it’s called SocialADR , the system is completely automated. You sign up to the selected social bookmarking sites, which takes a few minutes then submit the web pages you wish to be bookmarked. This is Social bookmarking SEO of the future, this system is so far ahead of anything else out there you’ll be stunned. There is a basic version with limited shares which is free – Free Backlinks to Site;. Check it out, truly incredible tool run by some really genuine people, if you get one the higher plans it basically is just set and forget – as far as social bookmarking tasks of SEO you’ve got it covered for whichever site you need. I’ve found it particularly useful for some of my gambling sites, it’s quite tricky to get links for these sites – gambling seems to have some sort of seedy reputation online despite literally billions of people actively enjoying the pastime. These bookmarking sites are a handy source of links for such sites though and you tend to get a very positive effect especially if you spin the descriptions well. At the end of the day the best social bookmarking is from thousands of different people, from thousands of different locations naturally linking to your site – but for sites never likely to go viral like this – these tools are an essential part of your Social bookmarking SEO toolkit. Marketing your Business Online – DIY or SEO Firm?